Creditors of Daewoo Shipbuilding & Marine Engineering Co. are in a dilemma over whether to provide additional assistance to the cash-strapped shipbuilder as the company is facing a liquidity shortage amid a sharp fall in new orders, industry sources said Sunday. The creditors, led by the state-run Korea Development Bank, announced a rescue package worth 4.2 trillion won ($3.63 billion) in October 2015 for Daewoo Shipbuilding, on expectations that the shipbuilder would clinch up to $12 billion worth of orders last year, and the delivery of newly built ships would go smoothly. But things turned out to be worse than expected. Last year, Daewoo Shipbuilding bagged a meager $1.55 billion worth of new orders, and the delivery of two drilling rigs worth 1 trillion won, originally scheduled for early last year, has been delayed to this year due to a customer's worsening financial status. Consequently, the shipbuilder failed to secure some 3 trillion won in cash last year. Usually, a shipbuilder receives up to 20 percent of contracts as down payments. Instead, Daewoo Shipbuilding has ratcheted up moves to sell its non-core assets to tide over its worsening financial situation. So far, it has raised some 1.6 trillion won by selling assets and laying off employees. The pending and sticky problem facing Daewoo Shipbuilding is to pay off 440 billion won worth of debts due next month. It has to refinance or pay off a total of 940 billion won worth of debts this year and 550 billion next year. 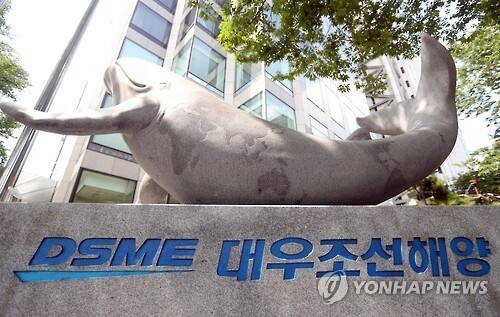 Creditors believe that the shipbuilder will be able to pay off debts that mature next month as the shipbuilder has some 300 billion won in cash and the creditors have some 400 billion won for assistance after spending 3.8 trillion won for debt-for-equity swaps and others for the shipyard. The remaining option for the creditors is whether to draw up an additional assistance for the shipyard in exchange for more bolder self-rescue efforts in the face of strong criticism that any additional assistance would end up in failure. The country's financial authorities are reportedly set to announce its stance for the shipyard's fate this month, and many believe that they would opt to salvage the shipyard from sinking as its demise could have far-reaching consequences on the economy.